Your recovery and rehabilitation is our primary focus so that you can maintain your independence and live your life to the fullest. Mountain Home Health Services provides care to people in a six county area including Cherokee County, Graham County, Macon County, and Clay County in North Carolina and Union County and Towns County in Georgia. 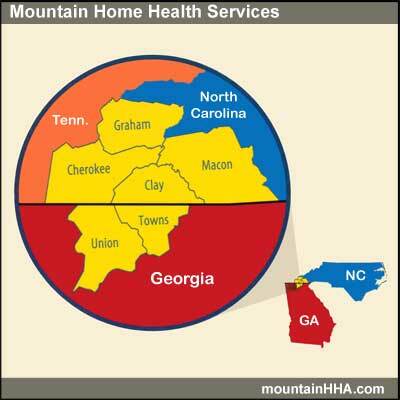 Mountain Home Health and Appalachian Home Health are now Mountain Home Health Services. Mountain Home Health has been providing services to people in southwestern North Carolina for over 45 years. We are proud to announce our recent purchase of Appalachian Home Health which has been serving people in North Georgia for over 25 years. By joining together under the name of Mountain Home Health Services, we will be stronger in meeting the needs of the communities that we serve, always focusing on providing the highest quality home healthcare available. Maintain independence and live life to the fullest. Your recovery and rehabilitation is our primary focus so that you can maintain your independence and live your life to the fullest. Our professional and caring clinicians are here to help. Our professional and caring clinicians will help you and your family understand your illness and how to participate in your recovery to better health. If you are facing a long term condition, Mountain Home Health Services can also provide services to assist you better manage the disabling effects of your illness. We understand that your successful recovery and rehabilitation at home begins with a smooth transition from the hospital or rehabilitation unit. Upon admission, our team will assist you by evaluating your home environment for safety and support -- ensuring that necessary medical equipment (such as hospital bed and oxygen) is in place, and ensuring that your medications are in order. We work with your physicians. Your individualized Plan of Care is developed by our team in conjunction with your physician to maximize improvement in your health. Communication with your physician is ongoing throughout Mountain Home Health Services care, as our mutual goal is to prevent further re-hospitalizaion for you. Mountain Home Health Services does not discriminate against any person on the basis of race, color, national origin, disability, or age in admission, treatment, services, and / or in employment.